I have my Grandpa hat on today because Grandma and I are babysitting our one-year-old granddaughter Iris, while her mom and pop perform at a music festival. I have not seen Iris in person for a few weeks, although I get regular updates on her activities though iPhone photos. Of course, it’s not the same. 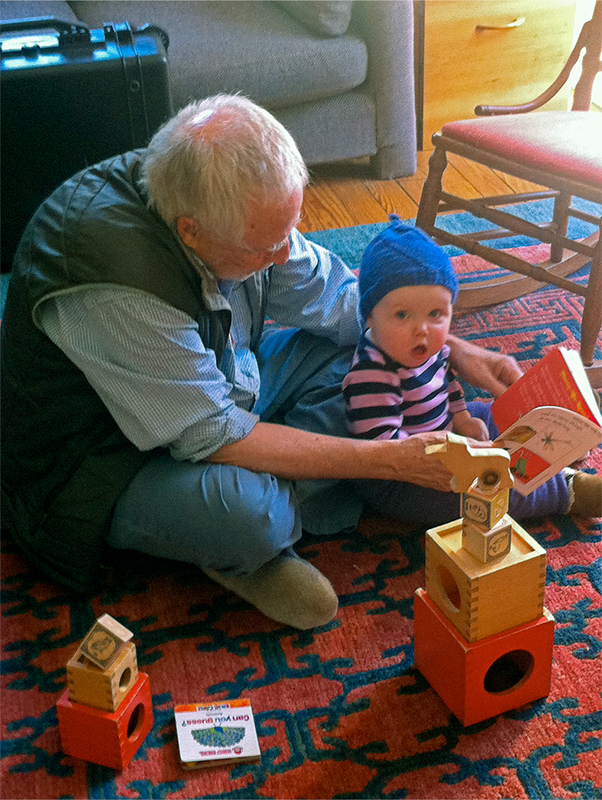 Iris is about to learn to walk, but she is taking her time, especially in Grandpa’s house. There is so much to see and do that the little girl is just busy all the time. If she is not crawling, she is pulling herself up on things and then, standing up, moving around the periphery of the room as much as she can. Today I have read Iris many books, gave her a bottle, joked with her while the two of us ate, and together we watched as our dog Molotov had some food. When she finally woke up to her tiredness, Grandma took over and put her to bed, an art I know little of. Before I talk about how precious time is, I have to say that as I grow older I continue to realize how absolutely dedicated women are to their children, IMO way more than men are with their careers or whatever we think we are doing. There is no comparison, or the comparison is absolutely humbling. After all, at my age I can’t help but realize one thing or another. If there is no realization now from day to day, I have a problem. Not all realizations are fun, but they are enlightening. Take for example this concept of how precious time is. For years, probably most of my life, I have been very conscious of how precious time is in terms of getting things done. I had so much to do (at least I thought I did) that I did not want to waste any time. The result of this approach is that anything but important stuff was simply not entertained. I literally didn’t take time for it. This is not quite as bad as I am describing it here. Another way to put this is that I was dedicated to whatever I was interested in, and there is always the fact that I had to work hard to make a living to support my family. I can assure you that making a living as an astrologer is not an easy thing to do. Well, the bottom line here is that I did not take much time to, as they say, smell the flowers. As an entrepreneur, I loved what I was doing, which was nothing more than following my heart and my passions. This was enough for me. In the throes of all that, I missed a lot of what I imagine others did not. Now, very late in life, I am discovering the preciousness of time I no longer have, the preciousness of the ordinary time that for all these years I just passed-on in favor of whatever current passion it was that I considered important. I am not saying this was wrong or that good things did not come out of how I spent my time. I did a lot to archive, preserve, and return to people the popular culture from which we all emerged, like popular music, movies and film, games, poster art, and, of course, astrology. And my non-career activities extend to photography and Buddhist mind training. That’s to my credit, and I don’t regret it. However, I am realizing that it is hard to turn off that drone of doing “important things” and just spiral down to earth to rest in my ordinary life and mind. Of course, my years of Buddhist training refer to little else than sampling and resting in ordinary mind. Funny I didn’t put the two together in all that time, although practicing meditation gradually led me there. And now, as I begin to husk off that sense of “importance” (much like a snake sheds its skin), it dawns on me (once-and-for-all) that there is nothing important that I still have to do (or am doing) other than have thoughts like these. And with that, my previously forbidden ordinary-life begins to intrude on my rigid sense of forward motion. I am slowing down. Whether I will get off my endless train of thought and wander through the fields smelling the flowers, I can’t say. At least I can see the flowers! It is ironic that what I considered the “preciousness of time,” those “important” things that I was doing all those years, was not it. Instead, precious time is exactly what I refused to entertain all that time, what I passed over in favor of work. In other words, I did everything else but smell the roses. Now that the work-switch has been turned off and a great silence is setting in, I can hear the crickets sing, and perhaps still have enough time left to get off at the next station and go sit in a field of flowers with my family.